When I first found out I was pregnant with Ulla, I had grand dreams of being one of those women who had a "belly only" pregnancy, ran up until the moment they gave birth, and only gained 25 pounds. Then I spotted around 7 weeks and became so terrified of miscarrying that I stopped running or doing really any form of exercise. Then morning sickness hit and I basically lived off of hot carbs and Taco Bell soft taco supremes. It was winter by the time I hit the second trimester, bringing snow and the holidays. We didn't own a scale and I was just trusting my body to gain whatever weight it needed to. Um, bad idea. I looked back on my prenatal visits and between Christmas and the end of January, I gained 18 pounds. EIGHTEEN. They recommend 1-1-1/2 pounds a week, so 18 pounds in 7 weeks was overkill, and what likely led to me gaining 50 pounds overall. I did become more active during the end of my pregnancy, when all I could really do was waddle, though there were some hill sprints around 41 weeks to try to induce labor. But I didn't feel good, I didn't feel strong, and despite having a relatively easy time with the pushing part of labor, my overall labor experience was long and exhausting. I vowed that things would be different this pregnancy, and they have been. First, the timing on this pregnancy was totally different, which has helped. I've been able to stay way more active outside during the summer, and the cooler weather of fall has been glorious. And we own a scale. I'm absolutely not a slave to it but it helps keep things in check, especially those first 12 weeks when technically you're not supposed to gain much weight, but you also crave hot carbs and vomit at the thought of anything you normally eat. I also haven't quit running this time around. I actually ran a half marathon four days before I found out I was pregnant, and was able to run about 10-15 miles a week until around 20 weeks. I started to get intense Braxton Hicks when I tried to run for extended periods so now I do run/walk intervals, and on days when that feels like too much, I just walk. Overall, my goal is to have dedicated workouts at least five times a week. Online workouts have been a lifesaver! I absolutely love the Baby Bump Prenatal Series, and it gives me zero excuse to not get a workout in. Even on days when I think my face looks super round, or when I loathe the cellulite that dimples my arms (why?!?!?! ), I'm so grateful for a healthy body that is growing a healthy baby, and am hopeful that all of this work will pay off in a shorter labor! 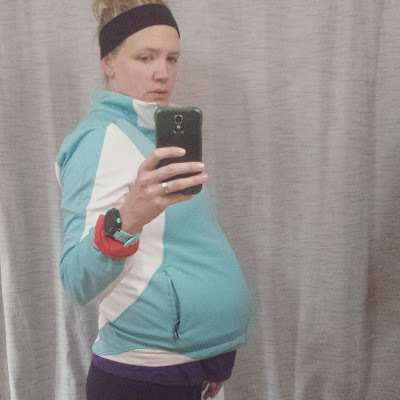 30 weeks and my running jacket still zips! Kind of.